You have, undoubtedly, had feelings of anxiety before. You recognize the symptoms – feelings of worry, apprehension, or dread. Your heart begins to beat faster, and you start sweating. Perhaps you have felt anxious when you have a big presentation or test that is coming up, or you are getting prepared to go to an interview. These kinds of feelings are absolutely normal. Everyone experiences anxiety at some point. It is your body’s normal reaction to a stressful situation, and it can be helpful in motivating you to get things done. However, when you feel anxious all the time, it is triggered with no obvious specific cause/reason, and it begins interfering with your life, it is time to do something about it. Otherwise, the anxiety can become so bad that you begin to avoid situations and isolate yourself, which can further lead to depression. According to the Diagnostic and Statistical Manual of Psychiatric Disorders, anxiety disorders characterize a large number of disorders where abnormal or inappropriate anxiety is the primary issue. In fact, anxiety disorders are estimated to affect 1 in 10 adults in Ireland, making them the most common mental illness. Fortunately, anxiety disorders can be treated, but it is first key to recognize the symptoms and then seek help. It is helpful to know whether you are suffering with regular, everyday anxiety that many people also experience, or if it is a full-blown anxiety disorder. More serious anxiety is unfortunately usually treated with unnecessary medications, but all types of anxiety can benefit from mind coaching. 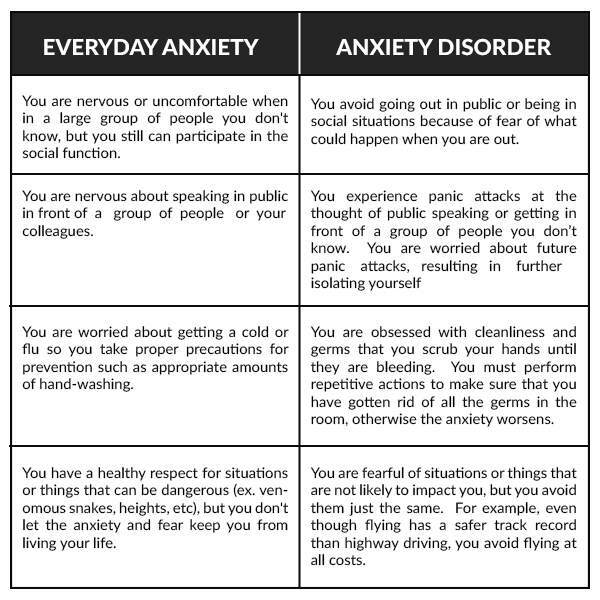 These are a just a few examples that illustrate the differences between regular anxiety and an anxiety disorder. Anxiety usually comes with certain feelings, physical manifestations, as well as thoughts. In a state of anxiety, you may have thoughts that are difficult to get rid of and that seem to repeat themselves. These can include negative thoughts about yourself, a situation, the future and so on. You are familiar with the little voice in your head that tells you that you cannot do something, or that you are a failure. If you listen to that voice in your head, it can cause anxiety or makes your anxiety worse. Often, negative thoughts come before the feelings of anxiety. They can also appear along with the feelings. These negative thoughts lead you into a vicious cycle. Thoughts lead to anxiety, then they maintain anxiety and finally, this anxiety may impair performance, thus “validating” the thoughts. Let’s examine this cycle more closely. First of all, you may begin thinking in a negative way about yourself or your situation. These thoughts are usually irrational, but persistent. There may be different thinking patterns, like thinking in an “all or nothing” way (“I can’t get anything less than an A on the test”), making less of the positive results (“I just got lucky, and that’s why I got an A”), thinking in a catastrophic way (“If I don’t pass this test, I’ll be kicked out of school and my life will be over”) or accentuating the negative (“I got an A, but it wasn’t an A+”). These thoughts all create certain feelings. You start to worry, to feel helpless, incapable, and lacking in control. You also begin to feel fear, for instance, fear of failure. As a result, you enter a state of anxiety. During this state of anxiety, these negative thoughts persist, sometimes making the symptoms or anxiety worse, as you continue to loop through these negative patterns. These thoughts may even become automatic thoughts – thoughts that are the first to appear in a situation. For example, when you hear you will have another test, you may immediately being to think negatively about your performance and capabilities. Then, you feel the anxiety again. 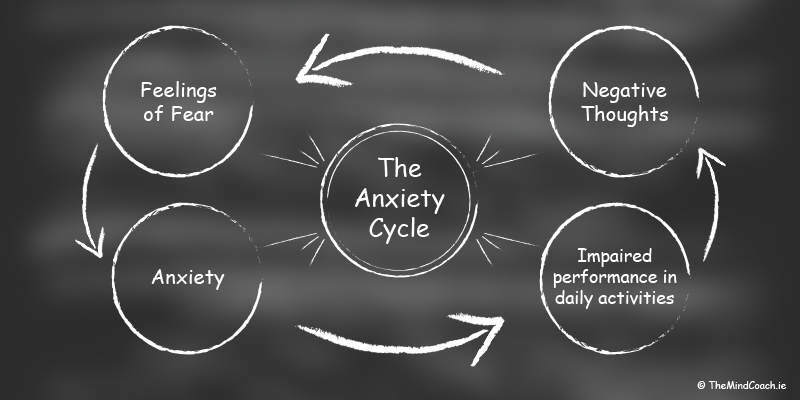 Sometimes, this anxiety can affect performance or results. This, in turn, may reinforce the negative ideas that you keep returning to. To sum it up, negative thinking can induce, maintain, and worsen a state of anxiety. These thoughts can create a vicious circle where thoughts, feelings, behaviors, and perceptions are all negatively affected. Instead, you need to change your thoughts and approach. When you do this, your anxiety decreases, your outlook on life improves, as does your performance in life. If you’re looking for help with anxiety, that’s what I do for my clients. 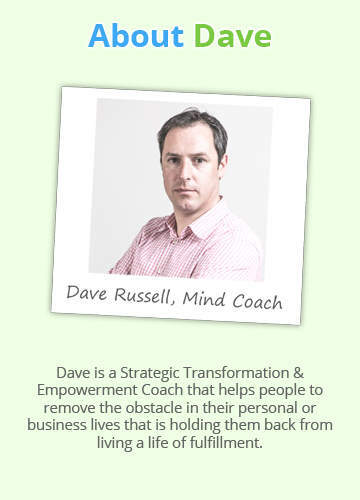 I help them understand how their anxiety is being manifested internally by the influence of their thinking and give them the skills to manage their emotional states, their thoughts and their mental health. 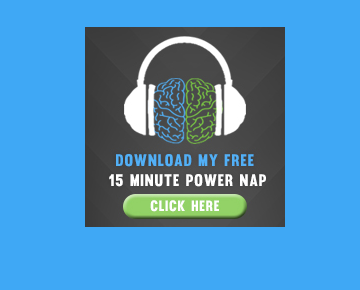 Imagine for just a minute, what it would be like to live a life free of anxiety and know that you can face whatever life has to throw at you and enjoy an anxiety-free life of happiness, joy and hope.